peek >> << back1st Street north of N, May 2004. The former Building 213 on the old Southeast Federal Center site, as seen from 1st and M in March 2007 (above), and in November 2015, with demolition completed. 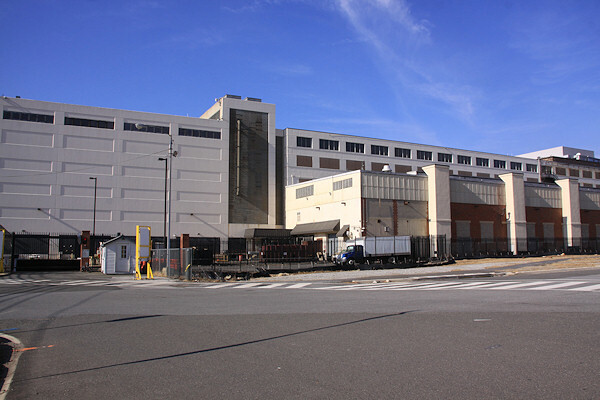 The building first became home to somewhat shadowy government operations in 1963 when the CIA moved into what was then the renovated Naval Weapons Plant warehouse with what the Washington Post described as "no announcement, no little ceremony, no welcome-to-the-great-southeast-sector fanfare." Eventually the Defense Mapping Agency (later renamed the National Geospatial-Intelligence Agency) was housed there (along with most likely some other cloak and dagger operations), until it moved to a new $1.7 billion campus in Springfield. Demolition took place in 2014, and eventually it will be replaced with office buildings. April 3, 2017 - A from-above view of Parcel A. Certain wags have taken to calling this new public space "Spooky Park" in honor of its previous tenants, though no doubt Forest City is probably not big on that name. Jan. 22, 2015 - The cleared site back in 2015, as seen from a Nats parking garage, to give an idea of location and scope, before the parking lot was reconstituted and the northern park area built. April 11, 2018 - A rendering released by Forest City in April 2018 showing a similar angle to the above shot, looking at the planned office building on Parcel F on the northeast corner of 1st and N Streets. A map from a 2014 zoning filing that shows the locations of "Yards West"--Parcels A, F, and G north of N, and H and I south of N--in relation to Nationals Park and the rest of the Yards. June 4, 2017 - A ground-level view of the New Jersey and M "entrance" to Spooky Park. This is expected to become a new entrance plaza (and maybe a Metro station entrance?) once Parcel A is built out. Aug. 20, 2016 - As part of the temporary plan for the site (technically known as Parcels A, F, and G), the Trapeze School New York's DC location has moved from 4th and Tingey to the northwest corner of New Jersey and Tingey, into this not-quite-so-spooky structure. 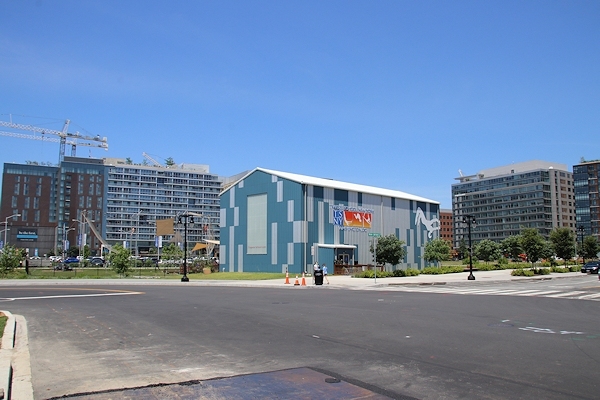 The northwest corner of New Jersey Avenue and Tingey Street, first with the National Geospatial-Intelligence Agency building still standing, and now in its new life that includes the Trapeze School New York. July 28, 2014 - Before and after at 1st and N.
Feb. 8, 2006 - The southwest corner of New Jersey and M, in all its spooky splendor. December 15, 2013 - The building's frontage along the portion of New Jersey Avenue that was built through in 2007. If you squint and know what your looking for, the Capitol Dome is visible at far right. June 16, 2018 - The same angle, with demolition done. Sept. 28, 2014 - Not much left to guard. Jan. 1, 2015 - The TV coverage of the NHL Winter Classic at Nationals Park helpfully provided this overhead view of the vastness of the Parcel A/F/G site after demolition and site clearing was completed. July 12, 2014 - Goodbye, Bat (a remnant of the Art Yards project). Two shots from the middle of the block along 1st Street. The first, on June 2, shows the Department of Transportation Headquarters acting as a temporary filler to NGA's gap. Nearly two months later, on July 28, it was almost all gone. June 14, 2014 - Om Nom Nom. December 15, 2013 - The south end of Building 213, after ArtYards had its way with it. October 16, 2016 - The same angle, with the new parking lot constructed but not yet open. May 26, 2013 - Before its tenants moved out, the NGA site was ringed with high levels of security. May 9, 2004 - When the neighborhood was a somewhat forgotten gritty industrial area, Building 213's high fences and gun-toting guards didn't seem like an issue. But as redevelopment got underway, and especially when Nationals Park brought 40,000 pedestrians 81 times a year to the sidewalk right outside a very secretive agency, it was clear that it was going to have to move.